Mouser now stocks the NXH3670 wireless gaming headphone solution from NXP Semiconductors. This ultra-low-power single-chip device is a 2.4GHz wireless transceiver with embedded microcontroller and proprietary audio streaming protocol to produce a solution for gaming headset applications. 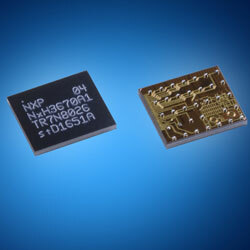 The device is BLE 4.2 certified and helps applications that need low-latency audio streaming. The wireless gaming headphone solution combines an Arm Cortex-M0 microcontroller with the company’s CoolFlux DSP core and hardware accelerators to help audio processing for streaming performance. Ideal for applications needing decreased battery size and extended performance time, the product offers industry-low power consumption of only 8.5mW during audio streaming. The device operates a proprietary audio streaming protocol optimised for gaming headset applications to give high-quality forward audio streaming at low latency of less than 20ms. The devices also support a simultaneous 16kHz microphone backchannel and a bidirectional wireless data channel. The device is offered in a compact 34-bump, 7.25mm x 7.25mm WLCSP package perfect for space-constrained audio applications including gaming and communication headsets, wireless speakers, and wireless microphones.